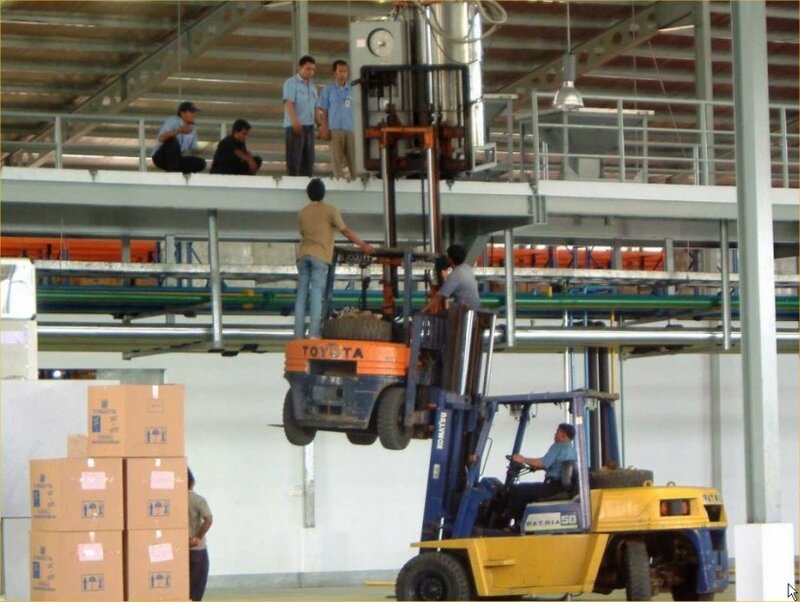 This site is dedicated to Forklift Safety Awareness. Always Place Safety First ! ! ! Closely supervised use of two forklifts to lift factory equipment to a raised mezzanine too high for one forklift to reach . . . There are men in place hanging on to the small forklift adding counterbalance weight to stabilize it and the load on the forks of the larger forklift. 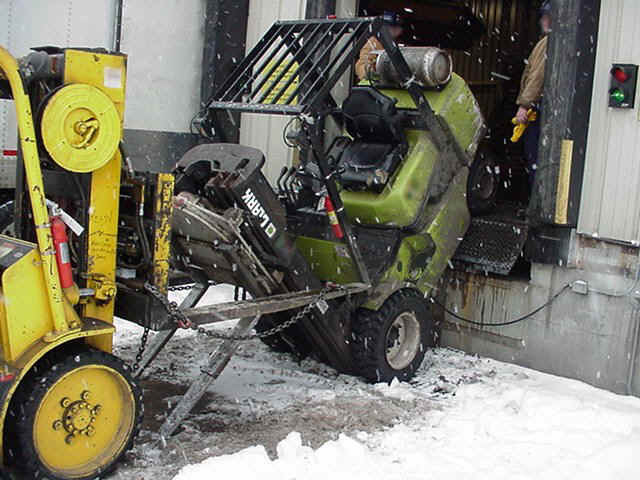 Certainly there's no grease or oil leaked on the underside of the small forklift or on the forks of either machine and the forks on both machines have never been altered or overloaded and were closely inspected before putting humans at risk. Right . . . They do have a spotter under the counterbalance of the small machine to shout out if he sees anything shift and they've got guys on the top deck to grab and drag the load off the small forklift when the big machine spins around in place where they can reach it to drag it off the forks of the small forklift. Information compiled on this site may be of benefit to workers operating a forklift, lift truck, crane or other powered industrial lift equipment or working in a manufacturing, agricultural, logistics or transportation environment where a forklift or other industrial lift machinery may be operated. Regardless of location, Company Owners or Officials are responsible for being aware of and abiding by local laws and regulations in their area.